The Pour Moi Cosmetic Clinic is regarded as one of the leading Bournemouth Botox clinics. 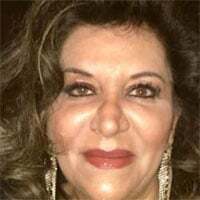 Headed up by Dr Awad, the clinic has been offering treatments and procedures in the local Poole and Bournemouth area since 1992, with Dr Awad herself having over 25 years of experience as a practitioner. We are competitively priced, and currently have a wide range of offers available. You can see our latest pricing shown below, or for more details click for current offers, and the cost of injections. Special introductory offer on BOTOX® treatment in one area for only £175 instead of £200. Call now to find out more. Special introductory offer on BOTOX® treatments three areas for the price of two for only £275 instead of £375. Special introductory offer on BOTOX® treatments two areas for the price of one for only £200 instead of £275. All prices include a complimentary treatment around the mouth and a check up after 2 weeks, with a top up if required. Regular clients who book their treatment in advance can take advantage of a regular’s discount. We have put together a collection of reviews and client feedback that we have received over the last few years. Should you wish to read those then please click here to see the type of great feedback that we regularly receive about the amazing results we produce. All the reviews we receive for the Botox treatment in Bournemouth we offer is 100% genuine and un-solicited. We hope it gives you the peace of mind that you are in the hands of an experienced and reputable local clinic. Here is just one example of recent feedback we have received on an independent reviews website. The Pour Moi Cosmetic Clinic is based in the Canford Cliffs area of Bournemouth and Poole. Our discrete and professional clinic is open from 9am until 6pm, Monday to Saturday. Visits to us are strictly by appointment only, and we only ever deal with one client at any one time. We are an exclusive clinic, with a superb word of mouth reputation that has meant we have helped hundreds of local people over the years with various skin procedures and treatments. When you do visit us for your Botox treatment, you will be sat in comfortable surroundings, and benefit from a one to one procedure performed by Dr Awad, and not by a junior consultant. We always recommend that before you embark on any procedure, you do your research. For those considering using a Bournemouth Botox clinic you can read more using the recommended reading at the bottom of this page, or also read this supplementary information below. Patients choose to use Botulinum injections (commonly known as Botox) as it can help to relax facial muscles, with the benefit of reducing the signs of aging with regards to lines, wrinkles, and crow’s feet. Botox is a temporary medical treatment that requires no surgery, but instead is administered via the use of small and fine injections. If you are pregnant or breastfeeding, then we cannot perform Botox in Poole or Dorset for you, instead you will need wait until this time passes and you are a more suitable candidate. We recommend that you always have a face to face meeting with Dr Awad before committing to having a procedure. This is so your suitability can be assessed, as well as talking through your medical history with you. There is no need for any anaesthetic, and after your treatment, you should expect to have smoother skin, with the facial muscles able to contract normally, meaning your facial expressions will be unaffected. It is a reasonably quick procedure of around 30 minutes, and is both safe and simple. We will only inject a small amount of Botox in order to reduce the chances of any discomfort felt. Clinical trials have shown that the duration of benefits actually increase over time, so there’s every chance that your repeat visits to our Botox clinic will actually become less regular and further apart over time. It can take around three to five days for you to see the difference once you have had the injections with us, and occasionally up to a fortnight for the full benefit to show. Should you wish to know more about Botox and how the treatment works, we recommend some of the following links and resources. 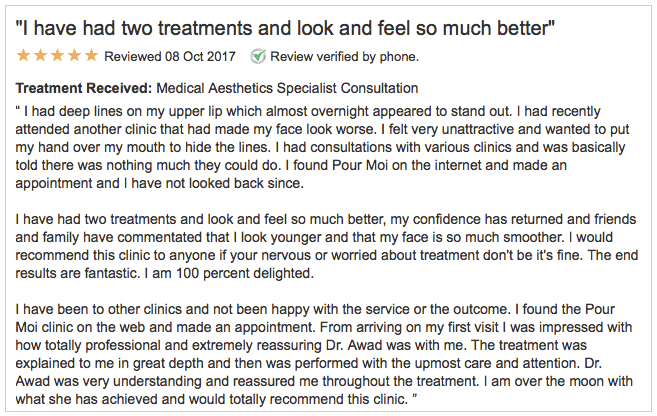 Once you have read this information, and you still have un-answered questions, you are more than welcome to phone the Pour Moi Cosmetic Clinic in Poole, where Dr Awad can talk you though anything else you would like to know.